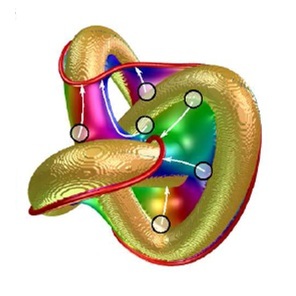 Journal of Physics: Condensed Matter invites readers to explore the recently published special section on Knots. Figure 3b Using the Pontryagin-Thom (P-T) surface to read the defect trajectories from a static picture. An introduction to research on the scientific properties of knots is provided within the special section Preface, contributed by Guest Editors Ivan Coluzza, Sophie E. Jackson, Cristian Micheletti, and Mark A. Miller. As an area of investigation which spans many sub-disciplines, the Guest Editors emphasise that “The aim of this Special Issue of Journal of Physics: Condensed Matter is to promote cross-fertilisation of ideas between research communities by gathering together the latest contributions to some of the major contemporary knot-related topics in condensed matter.” With this in mind, contributions to this special section include insights concerning DNA, RNA, proteins, synthetic molecular knots, collective phenomena resulting from knotted topology, and methods for assessing knot complexity. The JPCM special section on Knots can be found here. Front page thumbnail image adapted from Figure 3b, Miha Ravnik et al 2015 J. Phys. : Condens. Matter 27 354111. Copyright IOP Publishing 2015.